A friend of mine, a veteran of America’s 21st-century wars in the Greater Middle East, recently sent along his most recent commentary on Afghanistan. It would be his last, he said. “I’m done writing on how we got here — at this point I’ve said my piece, and I’m tired of being angry.” He’s moving on. By a more realistic yardstick – profits reaped by the MIC – Afghanistan has been a resounding success. As for all that collateral damage…Now what were talking about again? I didn’t want this war but knew with certainty that there was no stopping it. I thought we could stop the Iraq war but we didn’t stop that one either. Occasionally early in the Afghan war, I’d see some propaganda video with US soldiers building a park for some kids or a school and I’d have a tiny spec of optimism that we could actually not leave that country worse off when we left (not including the initial death toll and property destruction). We’ll never know what could have happened had Bush not been completely nuts wanting to go to Iraq. It isn’t true that we’ve never been acceptable nation builders since obviously Germany and Japan were not disasters like every single effort I can think of after that. I hope we never try again, but for the next country’s sake, I wish we could figure out what we are doing wrong lately. Japan was not a disaster? I call dropping nuclear bombs on large cities a disaster. Those bombs were not necessary. The war was winding down at that point. Revenge for Pearl Harbor? Hardly. Our intelligence knew they were coming and watched them approach. The US just wanted to show off the bomb. Sick. Just sick. Andrew, you make it sound like there was a point to Afghanistan. What exactly is the point of sending major numbers of troops and war paraphernalia into a backward country lying between Iran, China, Russia, Pakistan and India? A place pretty much directly opposite the world from the US? And since there was no point in getting in, it is of course appropriate to leave. Um, does that mean we are going to stir up something else stupid? Myanmar perhaps, or Pakistan-India? G-I hope not. The tail end of this article talks about Hillary’s and Soros’ involvement in an international crisis group. Accusations come just two days after Canada decided to proceed with an extradition hearing for Huawei executive Meng Wanzhou. War itself is terrorism and our country is the chief perpetrator of war. Anyone who wants to be our leader, should lead us away from the carnage we are causing and toward being an entity for goodness and peace. I cringe when I hear that we must gear up lest Russia or China challenges us on being the most powerful nation. We have that distinction now and we are a lost country; at war with our fellow citizens, feared by the rest of the world, led by a corrupt leader, and struggling to support our familiies but admiring those who get rich at our expense. Indeed. They wanted to frighten Russia, a tactic known as terrorism. Dropping 2 nuclear bombs on a civilian population remains the largest and most vile act of terrorism ever perpetrated. Japan was not a disaster? I call dropping nuclear bombs on large cities a disaster. Those bombs were not necessary. I agree with you, @Tarsus, @SuspiraDeProfundis, Noam Chomsky, and I’m sure many others on this point. SuspiraDeProfundis and I debated someone for a while who does not concede this point, but I imagine it is the consensus among readers on this site. When I wrote “(not including the initial death toll and property destruction)” I meant to exclude the war part which killed 2.5-3 million people from Japan (similar to Vietnam, I didn’t realize that) which includes several hundred thousand from Hiroshima and Nagasaki. I admit I don’t know a lot about the reconstruction of Germany and Japan after the war, and I’m sure the local people get a lot of credit - it isn’t like the US did everything I realize - but nevertheless something different happened in these two countries post-war than has happened in Afghanistan, Iraq, Libya, and other countries in Africa. Nation building is failing, and I’d kind of like to understand why given I don’t know if we (progressives) can stop the US from going to war yet - and if we don’t stop, it is better to leave the nation in a better state than the messes we’ve been making lately. I don’t see the comparison made in the media surprisingly - I would have thought this would be an obvious question - what is different now compared to post WWII? The US State went into overdrive to “whitewash” that crime. One of the reasons the Public so easily bought into that slop was because of “American Exceptionalism” , that blind belief that the USA would never commit war crimes because they are the “Shining City on the Hill”. I rememebr the followup to 9/11 where I entered into a debate on the USA Pushing the Iraq war dues to “links to 9/11 terrorists” and “weapons of mass destruction”. I suggested that these claims were a crock and just another lie to promote more war wherein tens of thousands would die for “US (read Corporate) self interest” I gave links to all manner of articles suggesting that the pretenses for war were being fabricated. In other words the persons responding in such a manner could not believe the US Government woudl act venally because they by nature “good” and they talked themselves into accepting the lie. This the same thing with those “Founding Fathers”. They MUST have been good people so somehow slavery and genocide becomes excusable. Since WW1 80 percent of all the peoples killed in wars are civilians. This statistic is well known. It is certainly known by Bacevich. As such ANY time a war entered into , those that orchestarte it and those that fight in it KNOW that 80 percent of those killed will be civilians. They still try and pretend there was a GOOD reason for that war. Dunno. Perhaps we’re getting better at war. Sure have had plenty of practice! I think Libya is in the worst shape yet, dealing in slave trade with any other unfortunates happening to go through that way leaving Africa. What we did to Libya sort of reminds me of what the Romans did to Carthage when it had risen to the level of a competing nation. Which reminds me of when I took Latin 2 while the Vietnam War was raging, 1971. That was when our class translated, “I came. I saw. I conquered.” The Romans were presented as the precursors of our glorious state of the US. I was the best student and the teacher expected me to continue into Latin 3. All I saw was war stories and gods flying around. I switched to Spanish the next year. And that reminds me of the way history was taught in school in those days. Don’t know what has happened since then. Very little discussion of culture. Most of my K-12 history was learning the numbers of soldiers and horsemen and the names and dates of battles. Generals’ names were prominently mentioned. My father had a lot of history books at home so I knew that history should include cultural discussions. In about fourth grade there was the story of the rival city states Athens and Sparta. Sparta trained its boys with war training. Athens gave their children music, art and philosophy. They went to war. Guess who won? Moral of the story? Well, look at us now. Eureka. The reason, the point, as Bacevich says, was simply poppy. Highlands, great for poppy! A central location to keep four of our Asian rivals plus our soldiers in great supply. The icky part was dealing with our allies the Taliban and their silly religious compunctions against drugs. Now we can leave because we have decided to move to highlands in South America, closer to our home market! Only biggie here will be getting the coca farmers to switch to poppy. Not a big problem, though! We will HELP them. 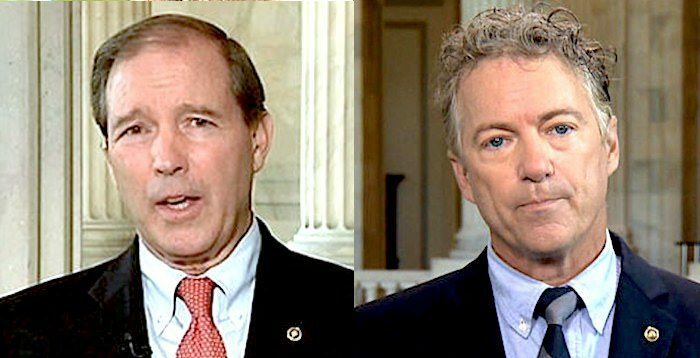 I think these two guys deserve some press because of what they are doing as well as because this direction is actually being led bipartisan!! !